A bit of a different post from me today - a recipe post! I love baking and try to bake something at least once a week. As I'm on a bit of a health kick, I count these as my treat of the week - everything in moderation! Today I have a recipe for chocolate peanut butter cookies. 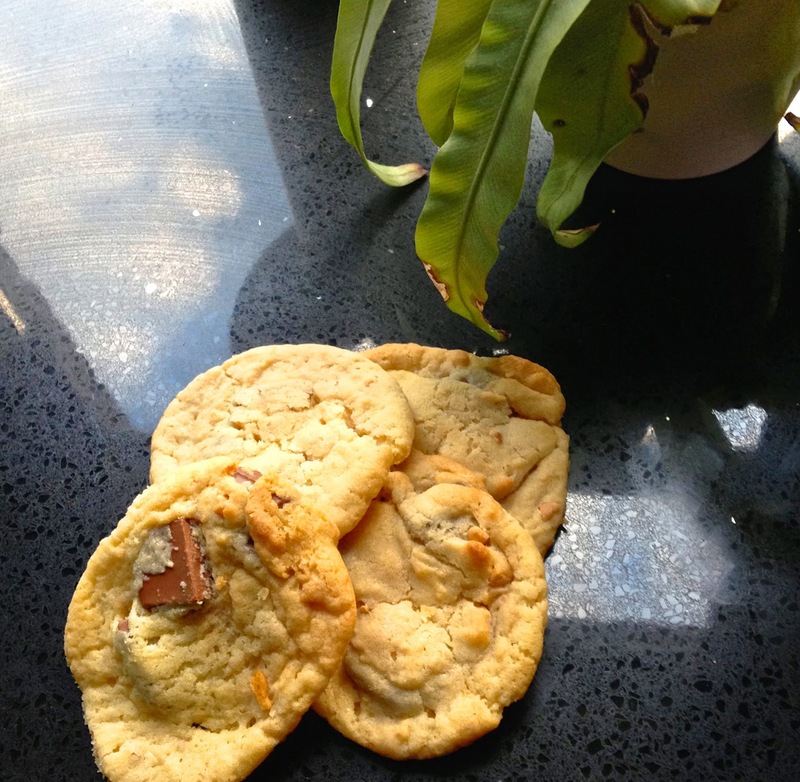 They're adapted from Tanya's 'Milk and White Chocolate Cookies' recipe in her Love Tanya book, so if you've tried that recipe, this isn't much different. It's also really easy and you can adapt it to suit your tastes on the day! Preheat your oven to 200c, then whisk your sugar and butter together. My electric whisk has actually broken, so I just used a wooden spoon and this works fine too - just some added arm work needed! Once this is creamy, add in the egg and mix again. Add in the flour gradually and work it into the mixture. Once you've done this, you will have your basic mixture. If it looks a bit dry, add a dash of milk, or if it looks too wet, add a little more flour. At this point, you can add whichever flavourings you want, so this is where I added my chocolate and peanut butter. Break up the chocolate into squares (you can make the pieces as chunky or as small as you like!) and stir the squares into the mixture. Finally, add your scoops of peanut butter. Obviously, the more you add, the more peanut butter flavour you will have, so it's totally up to your personal preference. I used around 4 heaped tablespoons. Then, begin making your cookies by rolling your mixture into balls and placing them onto a baking tray covered in greaseproof paper. For me, this mixture actually made 18 cookies, but it depends on how big or small you want them to be. Bake them for around 15 minutes, then leave them to cool for around 30 minutes. Then, enjoy with a cup of tea! They will be super soft with a crunch to the outside - perfect! Let me know your favourite things to bake in the comments!